There are a few different flavors in these bars that meld together deliciously, namely toffee/caramel, chocolate and a kick of espresso in the bar itself. I added a little extra salt to everything, which, for me, made everything that much more delicious. 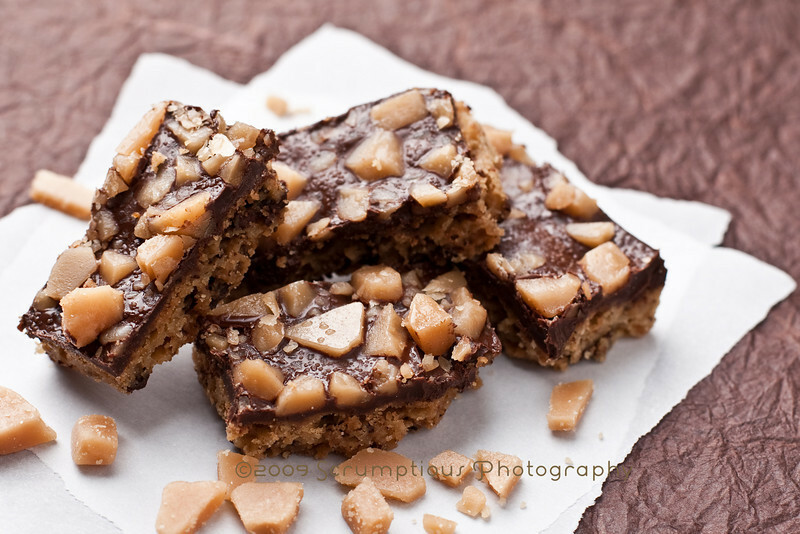 For the toffee recipe, I searched around and found a nice-looking recipe at Cooking for Engineers. 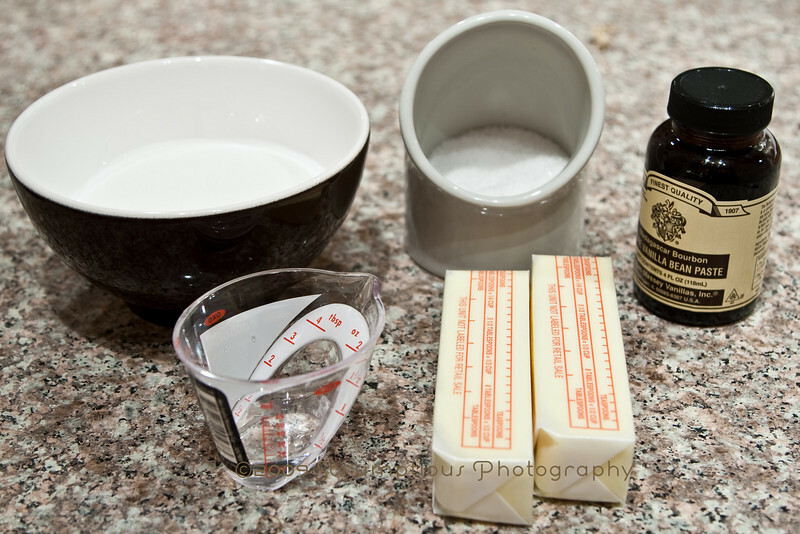 It's pretty simple, basically just combining butter, sugar, a touch of salt and a little water, cooking until it gets to 300° F and then stirring in some vanilla extract. The bars themselves were straightforward to make. 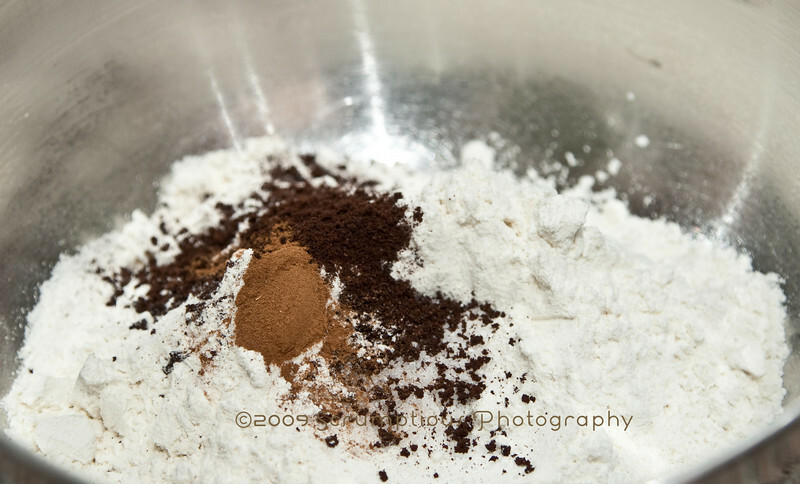 The slight twist was the instant espresso powder, which gave a subtle zing to the finished product. 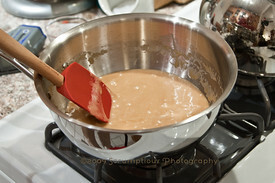 As Dorie said, the batter was very thick, so it took me a while to spread evenly in the 9"x13" pan. 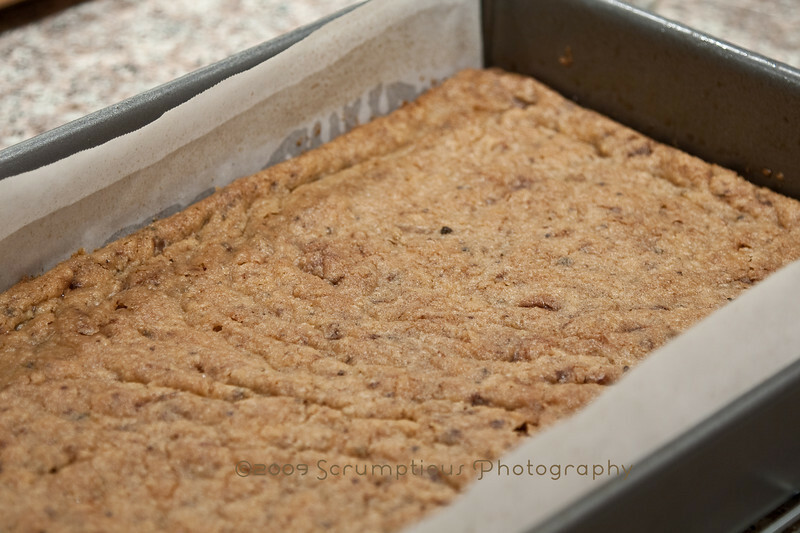 It ended up being more crunchy than sandy for me, so I was glad for the chocolate bits that broke it up a bit. I used a different type of chocolate on top than in the bar, and the different chocolates ended up working very well together. The one on top was slightly more bitter, which went with the espresso. 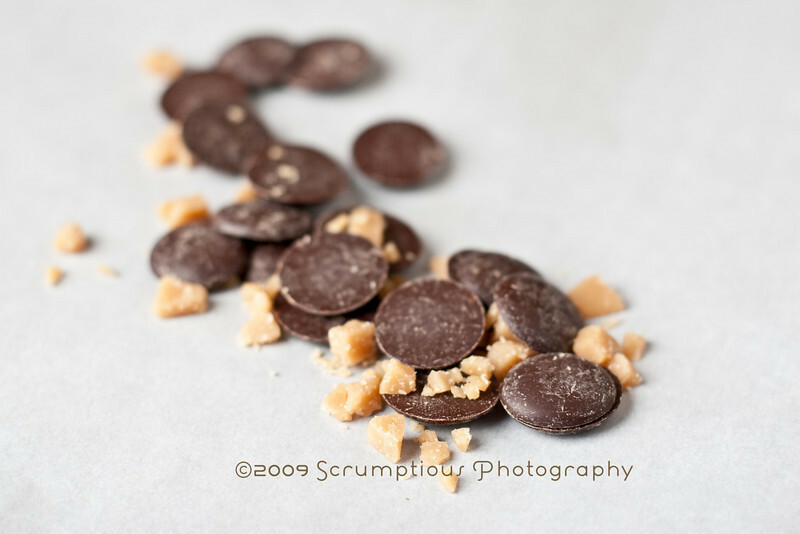 Here is the Toffee Bits recipe, with Caramel Crunch Bar info below. 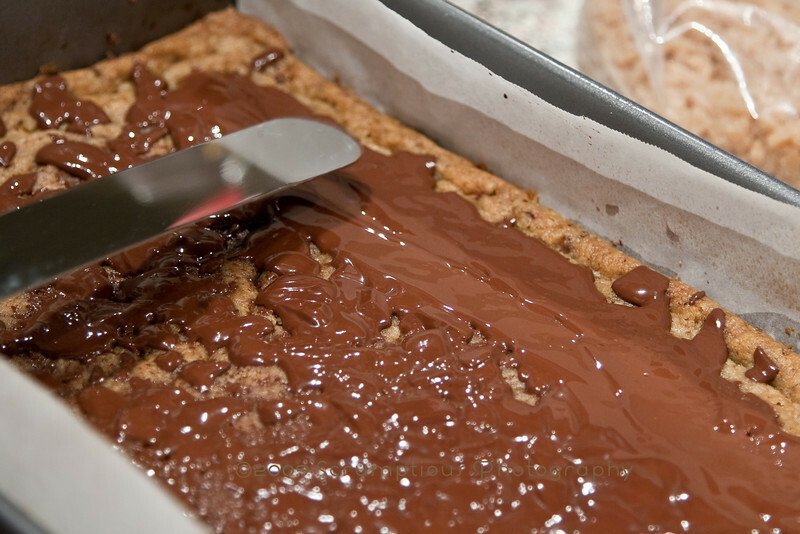 The toffee recipe makes more than you'll need for the bars, so you could halve it or third it. 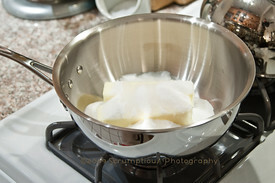 Melt the butter, sugar, water and salt together in a saucepan over low heat. 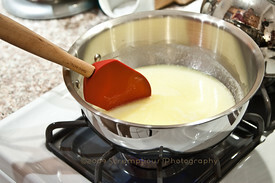 Continue heating and stirring until the mixture reaches 300° F (150° C). 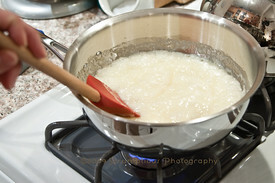 Remove from heat and stir in vanilla extract (be careful, it will bubble). 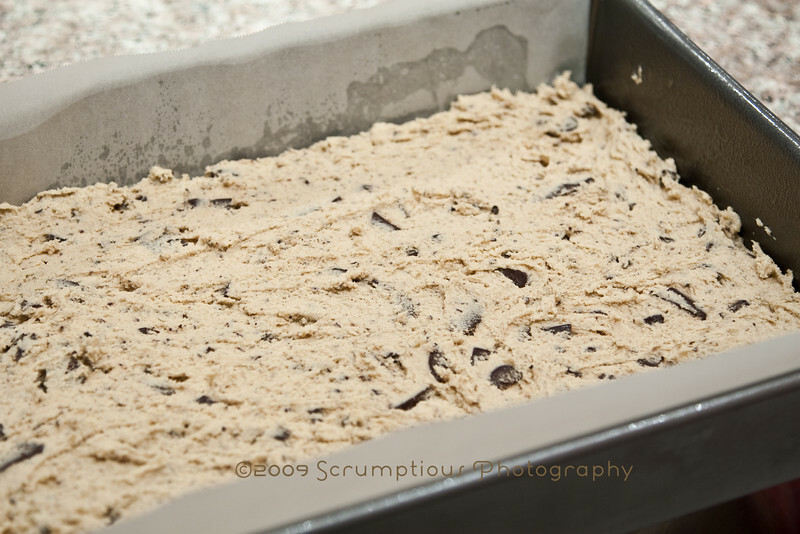 Pour hot mixture onto a sheet pan lined with parchment or a silpat. 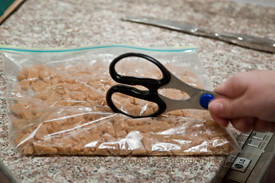 Let the toffee cool to room temperature and break apart into pieces as small and uniform as you can get them. Nutrition info is not too scary this week, but I DARE you to try to just eat one of these... it's impossible! ;) I guess the serving size should be doubled. Thanks to Whitney for this week's fabulous recipe! Don't forget to go check out her blog for the full recipe, and look at the TWD blogroll to see everyone else's creations. Another apology to my fellow TWD'ers this week, I am still very behind on my reading... just have a lot going on! Hopefully I can empty out my google reader backlog this week! kudos to you for making homemade toffee! Humpfff... it took me forever to get here and be able to leave a comment. I was here this morning and nothing was working... hum!? All that to say... that I think you ARE CRAZY WOMAN! 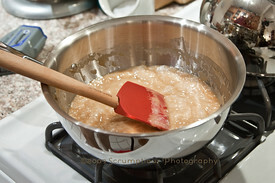 To make your own toffee... when you already have plenty to do!? Yet, I admire that... Bravo. Nicely done. 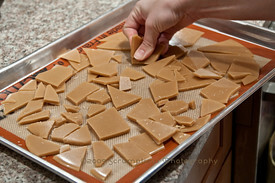 I love the homemade toffee. I will have to try that one of these days. well done on making your own toffee!! Your bars look great! Love all of your photos! Nice job! Your bars look fabulous! I didn't get to make mine this week.. but I'm really thinking twice... they look sooooo good!!! Great job! 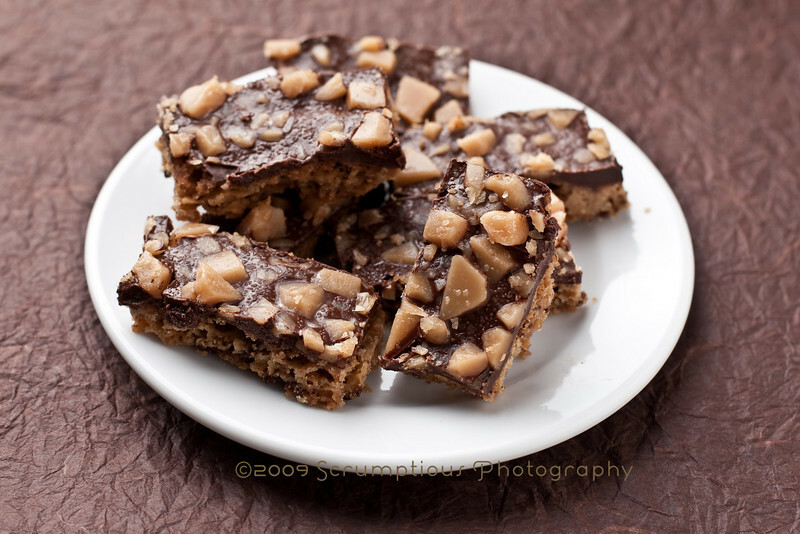 This is the first time I saw a toffee recipe on the net. In fact, I didn't know that these can be made at home. And those bars are amazing! They remind me my childhood, we used to buy these from small markets of our neighborhood. Now there aren't any. 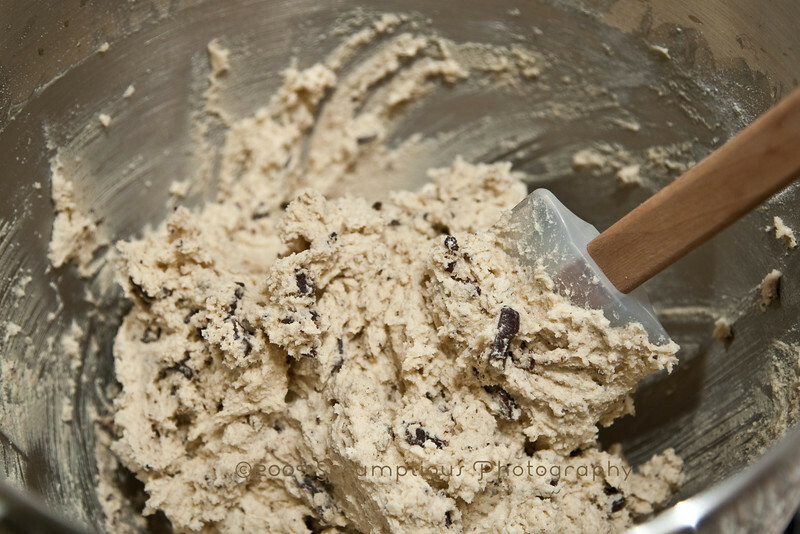 But you made me so happy as I can make it myself thanks to this recipe. 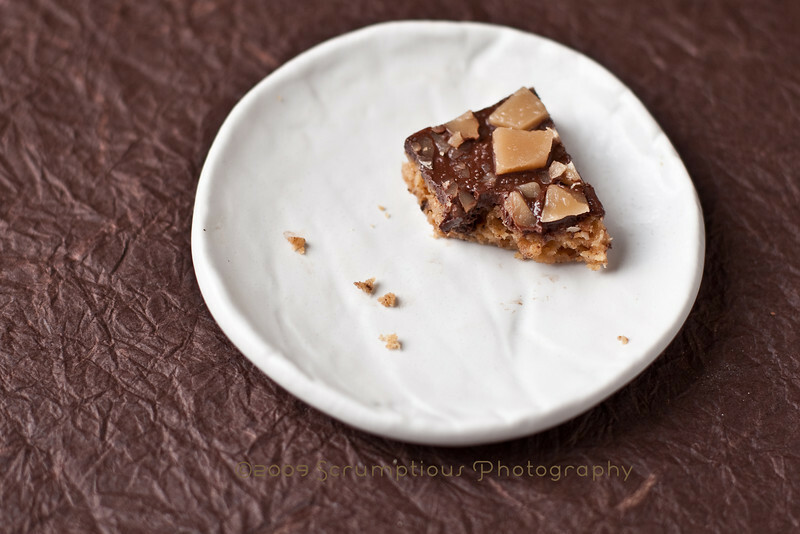 Thanks for the recipe for homemade toffee - I'll have to give that a try! That homemade toffee is perfection!!!! And your bars are great! I'm kind of relieved that these bars aren't TOO bad for you... somehow I have stopped myself at eating only 1. But it is SO hard. I always find myself reaching back for more only to talk myself out of it!! so good! and with homemade toffee--you are a star! Oh my goodness! homemade toffee - overachiever, you! :) Looks perfect! Your bars look delicious! 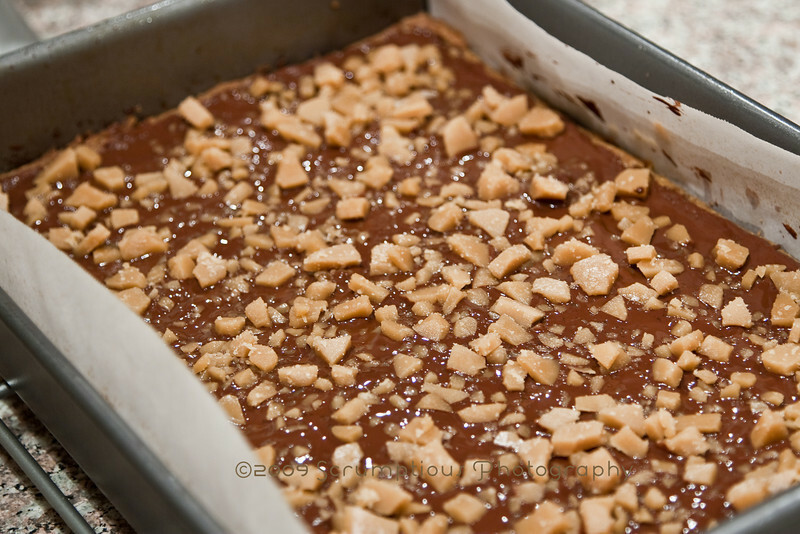 Your toffee looks ever amazing! The homemade toffee would make a huge difference. Everything looks delightfully delicious, as usual!! No worries, as you can tell, I'm a little behind on my reading too :) Those look wonderful, and isn't homemade toffee dangerous? Fabulous stuff. 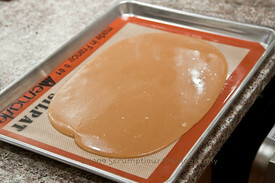 I love making toffee and its so neat you made your own. They looks scrumptious. Those look wonderful! I love the last photo! I would like to know if your toffee is crunchy or if it's chewy??? @Anon, the toffee is crunchy.